I must confess, I’m not much of a cook. It’s not that I don’t enjoy it, I’m just not very good at it. I lack that certain touch with spices, and everything I bake tends to be…just a bit off. My husband and daughter are much, much more adept in the kitchen than I.
Fortunately, Sherlock Holmes and Dr. Watson were much better situated when it came to foodstuffs. They had an able landlady, Mrs. Hudson, who looked after their board–often, the actual sideboard in 221B. Name one dish Mrs. Hudson serves our heroes in the Canon–and provide a recipe for it. One hopes that, for all of her hard work and patience, Holmes and Watson rewarded their landlady amply during the holidays. With some jewelry, for instance. Perhaps a lovely bracelet. Like this one…. 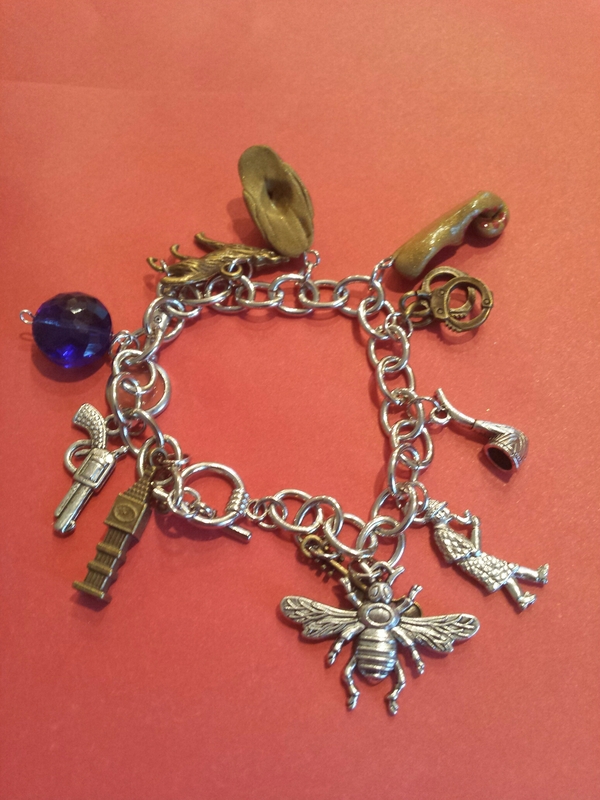 Made by The Artful Pippin, this charm bracelet features all Sherlockian charms and will be perfect for scion meetings, conferences, and those days when you just want a little Holmes in your life…so, everyday, then. If this is your cup of darjeeling, send your answer to me via Twitter DM, blog message comment, or FaceBook PM. Congratulations to Tatyana Dybina and Ching Ju Teng! They each win a copy of Bonnie MacBird’s “Art in the Blood” (I had an extra copy, so figured, why not?). There are quite a few artists mentioned in the Canon, and most were mentioned, including Reynolds and Kneller (HOUN), Greuze (VALL), Vernet (any and all–GREE), Raphael (3GAB), Rosa, Corot and de Bougereau (SIGN). One entrant mentioned two fictional painters–Lyons (HOUN) and Josiah Amberley (RETI), who wasn’t the artsy type of painter, but a painter all the same. A few who went unmentioned are Devine (either fictional or based on Belgian sculptor Paul Devigne, or British sculptor James Deville)–EMPT, and The “Belgian Masters” (HOUN), who included James Ensor, Henry Van de Velde, and Constantin Meunier. On the more villainous side, we have Wain(e)wright, who was “no mean artist,” and could have been based onThomas Griffiths Wainwright, a British artist and possible serial poisoner, who was transported to Australia where he ended up better known for his portraits than his poisonings. haha, yes, I put those in far ahead of time. Still compiling the answers! I was such an optimist when I scheduled those posts!